Limited METRO local bus routes will resume Thursday, Aug. 31, 2017. We will also have limited METRORail service on the Red Line from Fannin South Station to Downtown Transit Center. Bus shuttles will provide transportation along the line from Downtown Transit Center to Northline Transit Center. Red Line service will be running every 15 minutes. We also are providing limited METROLift service. Park & Ride will not resume until Tuesday, Sep. 5, and HOV/ HOT lanes and METRORail Green and Purple Line services will remain suspended until further notice. METROLift service is available for customers in need of medically necessary transportation as well as other life sustaining needs. Due to uncertain road conditions, it is still possible METROLift will not be able to reach certain areas to pick up patrons. Requests will be handled on a case-by-case basis. METROLift trips should be scheduled one day in advance in the normal manner: Online or by calling 713-225-6716 or 713-225-0410. Road conditions remain uncertain in some areas. Customers should be advised detours and delays are highly likely, patience is appreciated. METRO’s T.R.I.P. app may not be an accurate source of “next bus” arrival during times of schedule fluctuation. Riders asked to monitor METRO Twitter and Facebook pages for timely information regarding transit service. METRO also offers real-time information through its service alerts system. 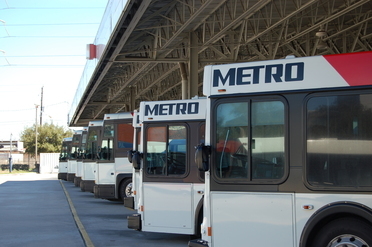 The Metropolitan Transit Authority of Harris County (METRO) is the region’s largest public transit provider, offering safe, reliable and affordable transportation services about 370,000 times per day. Besides operating more than 1,200 buses on METRO’s transportation network, METRORail's expanded system includes the Red Line (Main Street and Northline), Green Line (East End) and Purple Line (Southeast). METRO’s services also include: STAR Vanpool, METROLift, HOV/HOT lanes, Bike & Ride program, Park & Ride, and road improvement projects. Learn more about METRO services at ridemetro.org where you will also find useful tools like the RideMETRO app where you can plan your trip and even pay your fare from your phone.